Hello everyone! Nice to have time to write again for Ada Indonesia. Today we want to share a recipe from India. Hindi food is one of our favourite food. Even if I think we cannot eat Hindi food everyday, but it’s still our favourite. There is one Hindi Restaurant here in Tenerife that we like so much, the name of that restaurant is “Bombay Babu”. Yes! We need to write an article about that restaurant for the next post. One day I thought about the idea to eat Keema Matar with Polenta (a substitute of rice/pasta/bread). 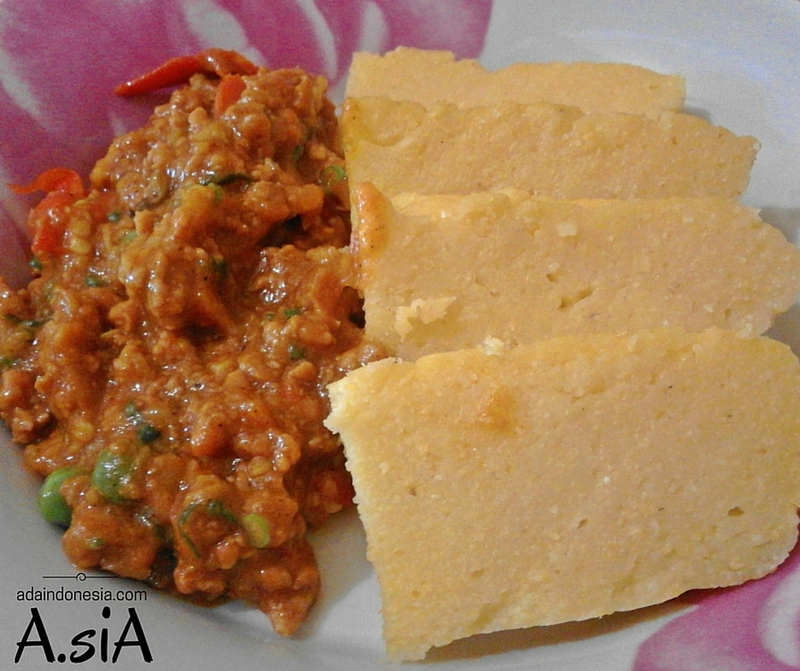 You can find the recipe of Polenta here in our website. It was a surprise for us that this Keema Matar goes really well with Polenta. I suggest you to try this great combination! So let’s go to the kitchen…!! First add the vegetable oil to the pan and allow it to heat up. Then add in bay leaves, and cloves. Sauté for some minutes. Add in diced onions, and let it caramelize (golden brown color), when it browned add grated garlic and ginger. Once the aroma comes out, add in the curry powder, and ground beef, mix well. After the color of the beef changed, add in the tomato sauce, and some water so the beef doesn’t dry. Simmer for 20 – 30 minutes. Around 5 minutes before it’s finish to cook add in the peas. Adjust the salt and add also garam masala. Stir evenly, and you’re ready to serve. You can eat Keema Matar with rice, but it’s even better to eat with Polenta.